1 of 1 Heat oven to 300 degrees F. Lightly coat 15-1/2 x 10-1/2 x 1-inch baking pan with nonstick cooking spray. Line bottom with waxed paper; spray paper. 1 of 3 Sift together 1/2 cup of the superfine sugar, the flour and salt into bowl. Sift flour mixture 2 more times. 2 of 3 Beat egg whites in large bowl until foamy. Add vanilla and cream of tartar; beat until soft peaks form. Gradually beat in remaining 1/2 cup plus 2 tablespoons superfine sugar until stiff peaks form. Gradually sift flour mixture over beaten whites, folding in flour just until combined. Spread batter evenly in prepared pan. 3 of 3 Bake in 300 degrees F oven 20 minutes or until top of cake is lightly browned and springs back when lightly pressed. Remove pan to wire rack. If necessary, loosen sides of cake with spatula. Generously sift confectioners sugar over top of cake. Cover top of cake with clean kitchen towel; invert onto another wire rack. Remove pan; peel off waxed paper. Starting from a short end, roll up cake and towel together. Place roll, seam side down, on rack to cool completely, 1 hour. 1 of 2 Simmer sugar, cranberries and water for 5 minutes. Strain well. Return to pan. Whisk in cornstarch; simmer 2 minutes, until thick. Cover; chill. 2 of 2 Very gently unroll cake. 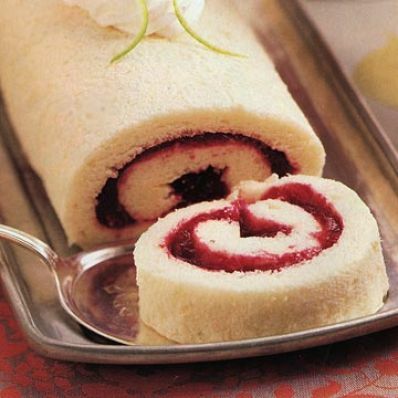 Carefully spread cranberry curd over cake, leaving 1/2-inch border; gently reroll. Place, seam side down, on platter. Refrigerate for up to 2 hours. 1 of 1 Beat cream and confectioners sugar in small bowl until stiff peaks form. Lightly brush cranberries with corn syrup; roll in granulated sugar. Garnish cake with cream, cranberries and lime rind. Per Serving: 1 g fiber, 108 mg sodium, 224 kcal cal., 0 g sat. fat, 0 mg chol., 0 g Fat, total, 53 g carb., 4 g pro.